Home News Behind the scenes Hackathon: What happened at HelpCamps? 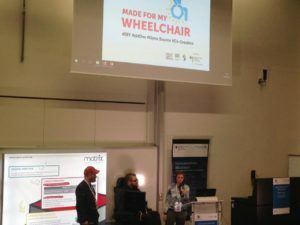 For two days people with special needs, makers and other experts came to the Hochschule Rhein-Waal in Kamp-Lintfort (Germany) to actively be part in the innovationsforum Help Camps. A full program of talks, workshops, a hackathon and more talks kept us busy and infused our brains, hands and all senses with new knowledge and ideas. The Hochschule Rhein Waal hosts one of the biggest barrier free Fab Labs in Europe and runs several projects on design for inclusion. It was an inspiring place to exchange ideas and practically work together on building new ideas for health and wellbeing with a special focus on users with disabilities. 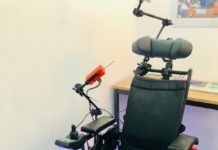 As a group from the Made for my wheelchair project we gave a talk and a open°light workshop to illuminate some wheelchairs, crutches and a walker with our DIY open source design lights. My favorite example from the Hackathon was the beginning of making a „hand to go“ for Chantal. Chantal has no hands and lower arms and wished to be able to dress and undress herself. She said that it would be her dream if she could have a hand that fits into her handbag so she can take it along. A team with Lars Thalmann from e-NABLE, William Mc Gill and Adriana Cabrera from the Fab Lab Kamp Lintfort continues on the development of the hand.